Scandal Season 4 Episode 3 just got my heart rate jumping and kept it up for what I think might have been the fastest hour I've seen on television in a long time. No need to go to the gym now! There was my cardio. And this wasn't even what I'd call a crazy episode. I'm so nervous for every single character on this series right now! Except for Rowan Pope. I'm not nervous for him at all because he's the only character who seems to have himself together. CYRUS BEENE! Why can't he see that this is a setup? I want the man to find a companion as much as he wants one himself, but 1) Cyrus is actually terrible at relationships and 2) he's smarter than this! Considering he once tried to set a man up, HOW CAN HE NOT SEE THIS!? I need Cyrus to have planted a wire on Michael's clothing after their tryst, maybe one he got from Rowan Pope, that recorded Michael's conversation with Liz so that he can use that to get her to back off a bit, partially because I'm not digging the character but mostly because that's a very Cyrus Beene thing to do. Try to screw him and he'll screw you twice. And harder. Or something like that. Wake up just like Huck and Olivia had to wake up when Quinn went missing for a day and no one noticed! Did you two seriously not notice that I have been gone for the last 24 hours? I spent three whole months keeping tabs on this office. I went to see you every day at the computer store. I constantly checked in with Abby at the White House. I found you halfway across the world. I'm the one who made sure this place didn't die. And I go M.I.A. for a whole day and no one even bats an eye. That is unacceptable. That is how Harrison died. We weren't vigilant. We didn't pay attention. So when one of us goes missing for 24 hours the other ones freakin' look for them. I understand how Olivia didn't pay attention since she's in her own head a lot of the time these days and having a hard time fitting back into her gladiator pants after all that time on the beach, but for Huck? Even if he hates her, he'd still notice if she weren't there. He doesn't miss stuff like that! At least he realized the error of his ways before she had the chance to run back to Charlie. Huck: I'll look for you. The next time you go M.I.A. I'll look for you. Permalink: I'll look for you. The next time you go M.I.A. I'll look for you. Though I still think she's going to run back to Charlie at some point. The lure of the darker side of being a spy is too great for her. Plus, his speech about being lonely was almost sad, especially when he threw in that "maybe it was you..." line toward the end. Charlie, Quinn, and Huck make the strangest love triangle on television, but somehow making it a triangle makes Huck and Quinn less weird. Sort of. It's becoming a common refrain these days, but poor Mellie, you guys. Bellamy Young is killing it as a woman on the verge of falling completely apart in the wake of one of the most unspeakable series of tragedies. She's lost her husband to his mistress (and repeatedly sent him to her even). She finally got to be with a man who loved her the way she deserved and it was torn away from her. She had to confront the fact that she was raped. Then she lost her son. And much of that in, what, under a year? If "Mellie Goes to the Psych Ward" were the title of an upcoming episode, no one would be surprised and at least half of us would cheer. It was great to see her wanting to get involved, but it was terrible to see just how overboard she went with the news story. Then the FBI agent went on and embarrassed her in front of the Cabinet members and the President and ugh. Hand the woman a plate of fried chicken and some Uggs. At least Abby tried. 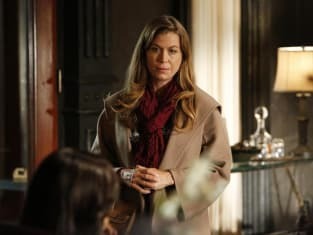 Speaking of Abby, how badass was she when she stood up to Fitz? There's a reason I like her and it's because she doesn't back down from people. Not even him. Fitz: I yelled at you. I owe you an apology for that. Abby: You do owe me an apology, but not for yelling at me. You owe me an apology for not bothering to learn my name. I'm Abby, Mr. President. Abby Whelan. I'm Scottish, by the way. Seriously. How hard would it have been for the entire staff to learn her name? Cyrus still calls her Red. Fitz called her Gabby. Mellie called her...nothing at all. I'm glad she stood up to Fitz and did it in a spunky, half-charming sort of way. Then the reveal came down that the only reason he was really apologizing was to get information on Olivia and I wanted to dump the second best Scotch in the world right into his lap. He fails at leaving Olivia alone. She's way better at avoiding and ignoring him. She knows that, for starters, not asking questions about him is going to help her in the whole "don't accidentally on purpose sleep with the President, who is a married man" thing. The characters earning the most concern from me this week are Jake and David, for various but related reasons. Their prior attempts to take down B613 are going to backfire in a huge way. Making threats against Rowan Pope is poking the bear. I want to believe Jake knows what he's doing in threatening Rowan with exposure if he doesn't leave D.C. and stay out of Olivia's life forever, but there's a tiny part of me who thinks Rowan would hurt or kill Jake just because he's a nuisance, and he wouldn't even care what it might do to Olivia if Jake were gone. David Rosen is going to end up in over his head using the documents he has to blackmail D.C.'s elite in order to get his way. Sooner or later, he's going to blackmail the wrong person and it'll be his head. Or the weight of what he's doing and the lives he's ruining will eat away at him until he's completely disillusioned by his place inside the bubble and he runs away screaming. To Vermont. Or back to Abby. Yeah, let's make that last thing happen, writers. They were good together. 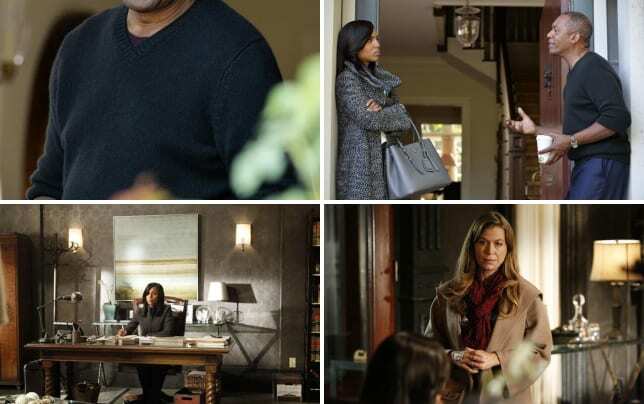 What did you think of Scandal Season 4 Episode 3? Are you scared/nervous/sad/anxious/whatever for any of the characters? I want to hear from you in the comments below! Until you can watch Scandal online, here's the promo for Scandal Season 4 Episode 4, "Like Father, Like Daughter."